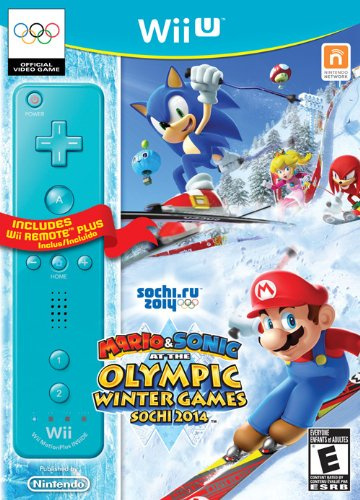 Already released in Europe, Mario & Sonic at the Sochi 2014 Olympic Winter Games arrives in North America on 15th November. Nintendo of America has taken the opportunity to officially confirm the Wii Remote Plus bundle offering in the region, a product that various retailers had listed in recent weeks. For a recommended price of $59.99 you can get the bundle pictured above, which also includes a blue Remote Plus; alternatively the standalone game with have a cost of $49.99 in stores and on the Wii U eShop. Rather like offers such as those with Wii Party U, Nintendo's aiming to offer attractive prices to enable Wii U owners to build up their collection of controllers. Two of the biggest names in video games are teaming up again for another Olympic Games-sized competition. Everyone in the family will be up off the couch, joining in the fun with all the other Olympic hopefuls. For our part, we feel this title doesn't hit its potential in our Mario & Sonic at the Sochi 2014 Olympic Winter Games review, despite some good moments and the inclusion of online multiplayer in the series. We did conclude that "there’s still a lot of fun to be had" with a group of friends, however. Are any of you in North America tempted by this Remote Plus bundle offering? Let us know in the comments below. Eh, I was tempted with the $50 price, $60, not so much since it's a meh game. Just like with Mario Party 3DS... I can see alotta kids asking their parents for this game. Is this bundle coming to NA? It's about as appealing to me as buying Wii U Party for the wiimote. I might just get both. I wish there was a bundle for the Mario and Luigi themed wiimote+. Those are the ones I'd really like, they would fit nicely with the Zelda themed one I have from my Skyward Sword purchase. In the UK the Wii Party U game and Wiimote is less than the price everywhere of just the wiimote plus. @SteveSnowmn The headline of this article clearly states "Nintendo of America"
I would get this if it was just $50. Game looks okay for the price. Wii Party U would be a better deal since it also has the stand and is $10 less. Anyway, I bought a Mario and a Luigi Wiimote, so I currently have 5. Enough for me. Too bad I now have 5 Wii Remote Plus controllers... I'll probably pick up just this game and Wii Fit U around the first of December. Picking this up the day it comes out, assuming Best Buy stocks it. I don't have any built-in Wii Remote Pluses so it's more than worth it to me. Cool color too. With all the deals retailers are offering there are so many ways to not pay a full $60 for this bundle. You're doing it wrong if you're paying full price for any game between now and the end of the year. Already have 4 Wiimote pluses but I'ld probably grab the bundle for $30 if I see a sale during holiday shopping.
" alternatively the standalone game with have a cost of $49.99 in stores and on the Wii U eShop." I know the official NL review was 7 out of 10 but I can't help but think somebody working there must like it more than that and would write a more glowing review. 1 trick pony bowling got an 8, though tennis only got a 6 so I guess they average out to 7. I'm ok w/ 7 though, it's an olympics game, that basically equates to licensed shovelware in my mind. The review read like a 3 though, I felt bad for the guy, sounded like he was suffering. I am get this bundle along with the Wii Party U bundle at target. Target is offering a buy 2 get 1 free deal. And both of those bundles qualify. I hope they will make this bundle in Europe too! Awesome deal here! A wiimote plus and a game I am interested in for $60 plus the WiiPartyU bundle. Interested in this for the Target buy 2 get 1 free deal! Of course I want the bundle, real question is if itll arrive stores near where I live. Getting this once I get a Wii U, which won't be until after Christmas. I love the Olympic games. Plus my son loves them too. It would be silly not to pay the $10 extra for the controller. Hoping to get this soon, since I loved the kiosk demo. I kinda want it, that along with the Mario and Luigi Motion+ controllers along with my Zelda will make it a complete collection plus despite the reviews I want to give it a shot because I really like the online features.